Our hearts go out to Esther and family and all of you at ACEM. Please convey our deepest condolences to the bereaved family of the late Rev Dr John Kao. We are deeply inspired by Rev Dr John Kao's passion and perseverance for mission, church planting and theological education. May God's comfort be with Mrs Kao, the rest of the family members, and all those who were touched by this faithful servant of God. To God be the glory! I am saddened t learn of the departure of our brother John, but now his body will be a peace. Lily and I are out of the country and will be returning April 3, so we will miss the service. I would be pleased to write a note of our history and working together, if that would be received. 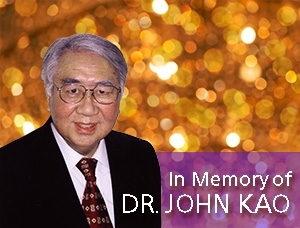 Please accept our condolences on the passing away of Rev John Kao. We are sad upon hearing the news but with comfort to know that he is with our Lord for His Words and promises remain faithful. May our dear Lord bless you and your children & grand children. We're sadden to hear the news. Memories of Rev. Dr. John Kao just flood our mind and heart. He'll be greatly miss as a mentor and friend. Holding all of you in prayers, specially Esther and the family. Thank you for keeping us update and thank Jesus for defeating death and that the victory is won. We'll meet again. We were privileged to be able to serve with Rev. Kao during the Journey program partnered with ACEM. And Rev. Kao had set a great model to us all. It is sad that we are "losing" one more spiritual warrior; but just as Mrs. Kao said when we visited Rev. Kao last Friday afternoon, "maybe it is good for the Lord to take him home soon." We can imagine how the Lord will say to him as he is in His presence now: " you have fought the good fight, you have finished the race, and you have kept the faith, now there is the crown of righteousness prepared for you. . ."
Let us uphold Mrs. Kao and her family member through our prayers. We are saddened by the loss of Rev. Dr. John Kao. He was a faithful follower of Jesus Christ and brought many lost souls to Christ during his years of exceptional ministry. Rev. Kao was a shining example of how we are supposed to strive to live a Christ-centered life. There is no doubt in our minds that Rev. Kao has gone home to be with the Lord and that, by the grace of God, we will have the privilege of seeing him again one day in Heaven. We will join him in an “everlasting life” in the kingdom of God. We know that you not only join us in this loss, but also in the celebration of a life that was used by God to bless many people. We were blessed and fortunate to have known him. "We little knew that morning that God called your name. the chain will be linked again." Like many others, we have been blessed to have known and been touched by Rev. (Dr.) John Kao. In his almost four scores sojourn on this earth, Rev. Kao was a humble servant-leader exemplar par excellence for today’s Chinese Christians. ?He was a modern-day Apostle Paul. Just like Paul, the LORD mightily used Rev. Kao and richly blessed his many ministries, serving the LORD our God around the globe. Although he experienced physical trials, God’s grace was always sufficient for him, for God’s power is made perfect in weakness for which Rev. Kao drew upon the Lord for strength. Many people would have given up, but Rev. Kao echoed Paul in that for him, “to live is Christ and to die is gain.” We have been blessed because God allowed him to keep on living in the body for almost eight decades. Today we rejoice in the LORD for Rev. Kao is now in the presence of the almighty God. We are saddened to learn the news of the passing away of our beloved pastor Rev. John Kao whom was our mentor and good friend. May God's promises daily strengthen Mrs. Esther Kao's faith, and may His presence give you peace through this difficult time. The Kao's family are in our hearts, our thoughts, and our prayers. Rev.Kao is a faithful servant of God. Even though I have only chatted with him a few times, I had heard his timely prophetic messages to the churches many times. I had the privilege of serving with Fred years ago in Winter Conference and am confident that the spirit of faithful servanthood is continued! This is a time of grief for the family, the Lord knows your grief. You are in our thoughts and prayers. This is a great loss to both the Kao's family and the Chinese churches. May the Lord grant you peace that transcends understanding. As coworkers in missions, COCM U.K. also send their condolences. I'm very sad to learn that Rev. Kao has passed away as he's a close friend, and a faithful servant in the Lord with a lot of ministries. While very sad, I am deeply sorry that I won't be able to attend his memorial service as I am in Hong Kong now. Please take good care and I am sure we will all reunite in Him when the Lord comes again.